We investigated disorders and regulation of cytosolic pH (pHi) in isolated perfused crypts from rat distal colon using the pH-sensitive dye BCECF. This preparation allows distinct examination of either luminal or basolateral transport. The effects of luminal weak organic acids and bases on pHi were examined. The physiological concentrations of both luminal CO2/HCO3 – and acetic acid/acetate acidified pHi significantly, but less than when applied from the basolateral side. Corresponding changes (luminal versus basolateral) in pHi were –0.17±0.04 versus –0.39±0.04, (n=8) and –0.15±0.02 versus –0.41±0.04, (n=8), respectively. Basolateral versus luminal application of NH3/NH4 + led to a more marked change in pHi, namely 0.35±0.03 versus 0.008±0.007 pH units, (n=19). The luminal perfusion of NH3/NH4 + was controlled by applying fura-2 acid to the luminal side and at the same time recording fura-2-specific fluorescence. Hence, the influence of luminal acid/base on colonic pHi homeostasis was limited. 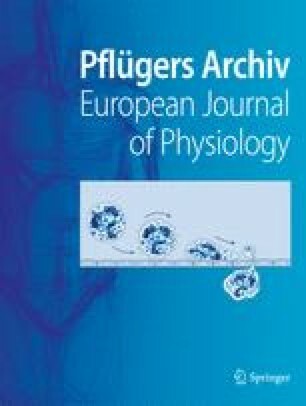 To examine pHi regulation, we investigated the recovery from an intracellular acid load using the NH3/NH4 + pulse method. Recovery was completely dependent on basolateral Na+, indicating that luminal acid/base transport does not play a major role in pHi homeostasis. The basolateral transporters involved in pHi recovery are probably the EIPA- and HOE694-inhibitable (IC50=0.2 and 2 µmol/l, respectively) Na+/H+ exchanger NHE1 and the DIDS-inhibitable Na+-dependent HCO3 – importer.